My first experience with Amy Watkins’ poetry was the Milk and Water preview “Never Never.” I try to approach every poem I read with a distant objectivity, but there was something about the experiences of the I in this poem that rang out as fact to me. The more I read, the more connected I felt to the poet and her real life beyond the page. Every word felt true. This is not a common interpretation for me. I’ve studied both nonfiction and poetry extensively, and something that has stuck with me over the years is the rigid objectivity I mentioned previously. I work hard to not impose my own idea of the author speaking each word. I couldn’t avoid it with this poem, though, because of the connection between the speaker (the I), her mother, her daughter, and the rich undercurrent of fear. I came away from each read tenser than the last. After completing Milk & Water, I had the privilege of asking Amy Watkins about the possible nonfiction elements in her writing directly. She confirmed my original suspicions, but her own words represent her work much better than I ever could. I’m not sure which one of us suggested the idea of recording our interview rather than relying on traditional distant Q & A, but I feel that hearing Amy speak about her poetry in her own voice is its own work of art. I hope that you excuse my nervous laughter and “ums,” and enjoy listening to our conversation about family, locality, and feminist rants. Amy Watkins grew up with the alligators and armadillos in the Central Florida scrub, the oldest child of a nurse and a carpenter. As a kid, she wanted to be an artist, a doctor, a teacher and a contestant on Star Search; she became a writer instead. Her poems and essays have recently appeared in Bigger Than They Appear: Anthology of Very Small Poems, BloodLotus, and Animal: A Beast of a Literary Magazine. She lives in Orlando with her husband and only child, Alice. where fishers brought home their golden boats. our dead sister, the sea, and you. I think you would forgive us. split bill clatter and wheezing quack. I didn’t bake the pies you asked for Christmas. I kicked the dog for peeing on the rug. I told your grandchild there is no such place as heaven. to believe. I didn’t know what else to say. following a script with pages missing. I would be a doctor. Something like that. with the clean back of your wrist. You know three of the other nine. “Things You Don’t Know” appeared in Amy Watkins’ book, Milk and Water, available from Yellow Flag Press. Purchase yours today! Listen to an audio recording of “Things You Don’t Know” read by the author! gently with the flats of her long fingers. “The Viewing” appeared in Amy Watkins’ book, Milk and Water, available from Yellow Flag Press. Purchase yours today! Listen to an audio recording of “The Viewing” ready by the author! and challenge to the water. and she does not search for one. taken and returned by tsunami waves? milk and water for gods’ rage and mercy. She names the boy a second time, his own name. flushed with heat and marked by birth. All shells know: the ocean is inside. 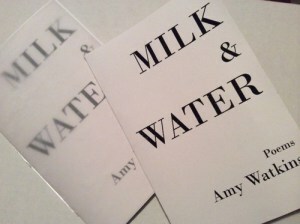 “To the Water” appeared in Amy Watkins’ book, Milk and Water, available from Yellow Flag Press. Purchase yours today! Listen to an audio recording of “To the Water” ready by the author! after the doctor leaves with his uncertain news. her lungs and heart like a heavy blanket? like the light from the open door? at her temple, and I wonder if he feels its flutter. than this,” she says and means the two of them. and he blinks, rapidly, his blue eyes. we will touch hands, palm to palm. “Firstborn” appeared in Amy Watkins’ book, Milk and Water, available from Yellow Flag Press. Purchase yours today! Listen to an audio recording of “Firstborn” read by the author!